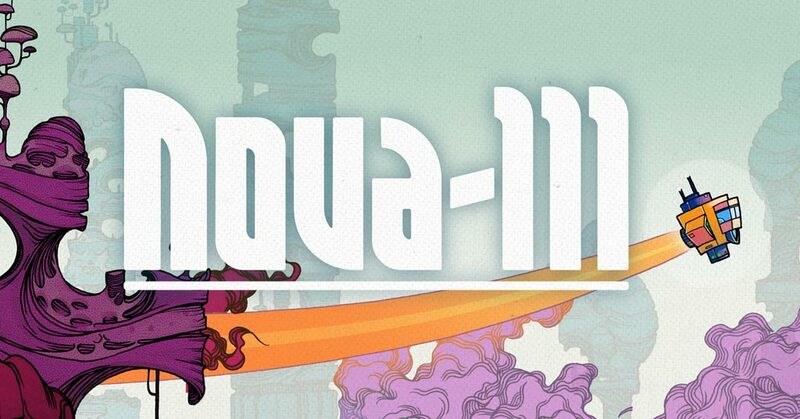 I’m not sure if I find it awesome or groan-worthy to literally send a game into space, but at least I can tell you what I think of the game itself, Nova-111. It’s a game that looks like a space shooter, but in reality, it’s… well, it’s complicated. For one thing, the game is turn-based–sort of. Your ship can move one space each turn, and most enemies will move or attack right after that. However, there are some enemies and other objects that act in real time. Usually, these actions start to trigger after you’ve attacked, which you can do simply by smashing into your target. An enemy might multiply or explode after a couple of seconds, forcing you to act quickly. As the game goes on, turns continue to be important, but when it comes to combat situations there’s not much stopping to think. In addition to movement and waiting to pass a turn, there are a few gadgets available to you. 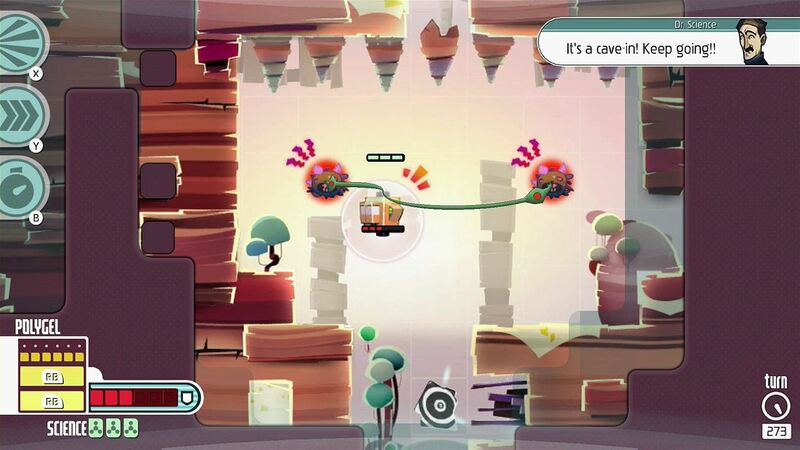 First is the gel bomb, which stuns enemies around you but requires you to collect gel pieces to use. Most of your other options use the resource of “Science,” which regenerates over the course of several turns. These include a laser for busting enemies and tough rocks at a range, a short-range teleport to get you past certain objects, and a stopwatch that stops all other actions, turn-based and real-time alike. Sound messy? It can be, but often the enemies are only on screen for a few chaotic seconds. The truth is, most of this game’s content and play time is actually in puzzles. With switches, pushable boxes, locked hatches, sliding spaces, and strong wind, there’s a lot to be said for the thinking you have to do to get through this game. A lot of the more elaborate puzzles involve invincible patrol robots that move in predictable–but changeable–patterns. They can hit switches, smash through rocks and more if you just show them the way. It’s even more crazy when you realize this is all mixed into levels that are otherwise procedurally generated. That sort of makes me wonder how they do it. 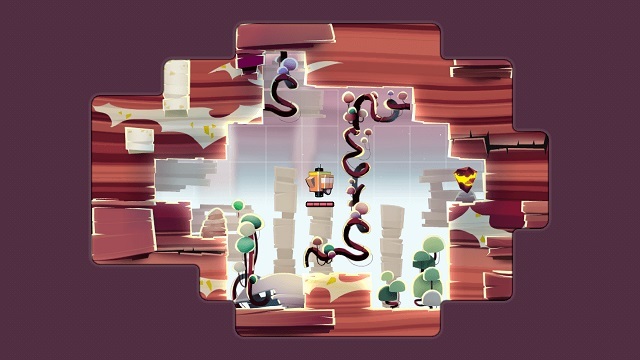 Each level has a handful of maps, capped off by portals that take you onward. While you can just push your way through, there are lots of stranded scientists to rescue, secret alcoves to find, and hidden “treasures.” By picking up four treasures, you can upgrade your ship’s health. That said, the other extras don’t seem to have much benefit beyond the pursuit of full completion. In addition, there are two leaderboards on each level: shortest time and fewest turns to complete. The rankings are usually completely different, which shows that the dual focus on turns and real time actually matters more than you might think. It’s a good thing that these extra objectives are there, and that your companion, Dr. Science, often has witty commentary on the situation. With these things combined, you can forget that the main objectives end up being really easy, that the game is so short (I estimate 4 hours, generously), and that there isn’t a coherent story. Dr. Science will tell you that he and the other scientists were stranded by a mysterious accident, and you’ll spend much of the game investigating their lab and the tear in time caused by it. Yet, when the final boss is “revealed” at the end, it isn’t so much a twist as a shot out of left field, and the accident’s true nature goes unexplained. Still, for a game that’s trying so hard to be so many things at once, Nova-111 is not half-bad at most of them. The mixed combat in both turns and real time really does have a unique feel: every decision is important, but made under pressure. 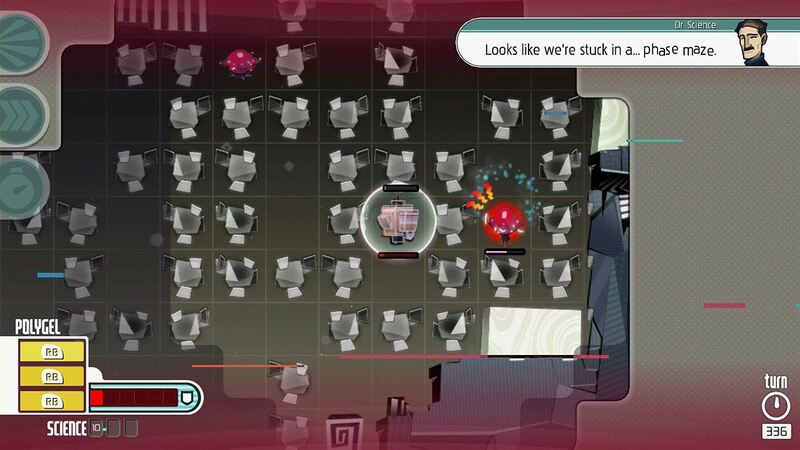 And although the puzzles are not anything mindbending, they do make interesting use of the mechanics at least. Graphically, this game is beautiful in its simplicity. 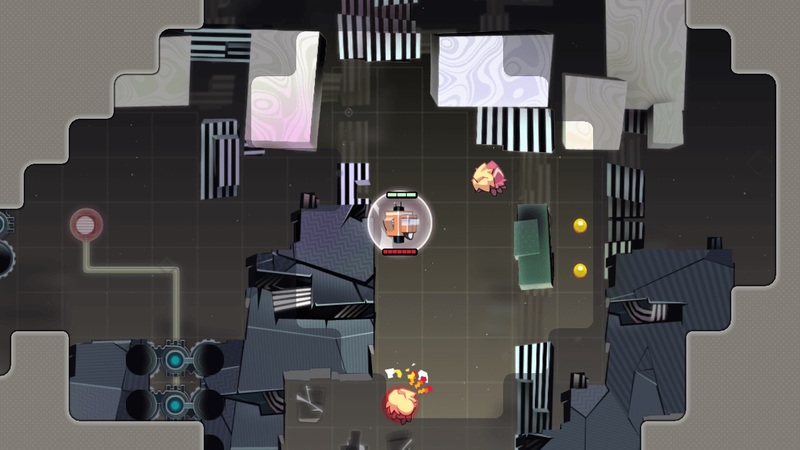 Each block and background object has a unique handpainted feel to it, with the player and enemies standing out with a slightly more cartoony style. The play between the foreground and background objects always looks amazing, although on occasion, it can be unclear which one a block is, causing you to run into a solid roadblock that you didn’t see. 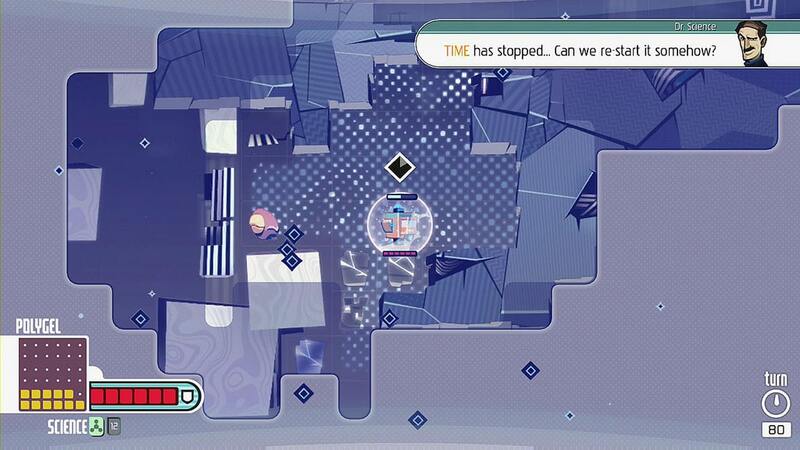 The game’s music, meanwhile, is a pleasant techy sound that urges you to take your time even when things are chaotic. Nova-111 is far from being as simple as it looks, but I kind of like it that way. Unlike the vast majority of games that play with such varied systems, it isn’t really overstretching its boundaries. I didn’t have any ridiculously fun moments, and again, the story is a letdown, but at the core, there’s just some plain old solid game design going on here, which seems oddly hard to come by these days. I can’t speak for the level editor that’s about to come out, since that’s still in the future, but the game as it stands is quite good. You can grab it on practically any console for $14.99 USD.